The term “Shaker” refers to a sect of Christianity founded in the 18th Century – officially named as the United Society of Believers in Christ’s Second Appearing. This particular belief system developed into a society that focused on simplicity and functionality, both in an individual’s way of life and in the items with which they chose to surround themselves. Shaker style furniture was developed as a result of this rejection of needless opulence and the embracing of practical, well-crafted goods. Of course, this philosophy fits in perfectly with the modern love of minimalism and “decluttering”. Clean lines with only the simplest and neatest of decoration make this style of furniture an excellent choice for a multitude of different interiors, and the sturdiness and quality of the craftsmanship that goes into each item results in excellent longevity. Buying Shaker style furnishings usually means an investment for life. Why Consider a Modern Shaker Style Kitchen? In order to bring this traditional style of furniture design right up to date, kitchen retailers are now able to combine the original ideologies of Shaker craftsmanship with more recent features, such as soft closing doors (an element that will help units further resist wear and tear as well as making cupboards and cabinets safer and quieter to open and close) and a variety of finishes. Of course, the traditional wood look is often preferred in order to enhance the traditional and sturdy feel of the kitchen units, but in order to complement more modern kitchens, there are now a variety of colours on offer – from light and bright Ivory to soft, dark Dakar. What is the Difference Between Luxury Shaker and Roma Shaker? The Kitchen Warehouse stocks two different lines of Shaker style kitchen units and Shaker style kitchen doors – Luxury and Roma. There are only very subtle differences between the two, with both offering softly curved edges and well-thought-out storage solutions to keep your workspaces clear. The Roma look, however, has a slightly more contemporary feel with strong lines and edges, as opposed to the slightly more traditional “farmhouse” quality of the Luxury line. How is a Shaker Kitchen Made? Keeping the traditional ideologies of this particular school of design in mind, cutting edge technology is expertly used to cut each piece of your Shaker kitchen into shape before it is delivered flat-packed to your home, ready to be assembled. Hinge holes are ready drilled into each hole and unit, and the legs of all cupboards and cabinets can be neatly adjusted to your ideal height. The same goes for all hanging brackets and wall fixings for use with overhead units. Everything from the Shaker kitchen’s design to its creation, construction and final appearance is simple, straightforward, fuss free and beautiful. You can choose your ideal colour and select from a variety of beautiful surfaces to match or provide a gorgeous contrast. Because of the obsession with simplicity within the Shaker school of design, all kitchen units, surfaces and doors are wonderfully easy to clean with hardly any awkward corners, and you can opt for soft rounded corners – whether for aesthetic purposes or to create a safe environment for little ones and pets to run around. 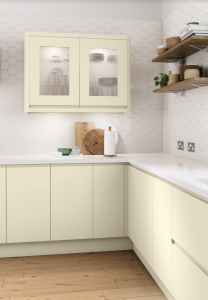 The sturdy walls of each kitchen unit have a thickness of 18 mm, with their doors boasting a rock solid 22 mm of PVC finished with an attractive wood effect – meaning there will be no warping at high temperatures or as the result of humidity, and they’ll withstand a great deal of manhandling. All of this is achieved while maintaining a truly traditional, subtly elegant look. All of the above is provided by the Kitchen Warehouse at superb prices, with soft close hinges included as standard. Browse our options online, then, when you’ve decided on your favourite look, come and visit the Kitchen Warehouse LTD showroom at Hutton Moor Farm, Hutton Conyers, Ripon, North Yorkshire, HG4 5LZ. You can speak to any of our sales assistants for help choosing your ideal design. Remember, you should always take a look at your favourite kitchen designs “in the flesh” before you commit to a purchase. That way, you can be sure of their measurements and the way that they will function when in the space – avoiding headaches later on. Our Shaker range comes in Ivory, Cashmere, Dove Grey, Mussel, Stone and Dakar. Additional colours within the Roma Shaker range include Brilliant White, White Cotton, Cream, Biscuit, Light Grey, Dust Grey, Lava, Graphite, Sage Green, Duck Egg Blue, Powder Blue and Ballroom Blue – so you’re bound to find a shade that matches the rest of your interior design visions.